The amazing time of the Renaissance gave the history of many brilliant sculptors and artists. It is noteworthy that the talented people of that time possessed precisely a versatile gift – a pictorial, sculptural, graphic, and at times, architectural one. More than 5 centuries the genius of Raphael delights with the images of a beautiful person, the embodiment of the idea of ​​the harmonious beauty of life. Portraits and multi-figure compositions are distinguished by their originality and reveal all the best and significant that is inherent in the personality. The architectural talent of the master is felt in the conciseness and harmony of thought in his best paintings. 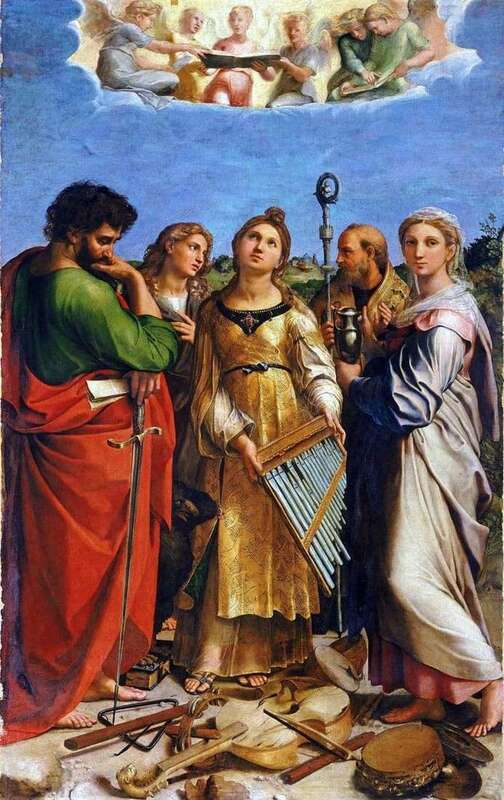 “Saint Cecilia” was written by Raphael, commissioned by Cardinal Lorenzo Pucci for the family chapel in Bologna. The composition brings to the fore the figure of Cecilia, whose spiritual face is elevated towards the sky. Six singing angels attract the eye with amazing expressiveness of faces and figures. The artist removed the moment of revelation, where the frozen Cecilia stands out from its companions, whose views are directed to worldly affairs. The picture is painted in warm golden – brown tones, where only the monumental figure of St. Paul stands out with a green color spot and creates an additional accent in the overall composition. The harmony of images is achieved by undulating lines that create intertwining streams. These are the folds of clothing and the contours of the figures, the outlines of the heavens with singing angels. The integrity and completeness of the picture create a special world in which you want to peer, finding all the new details.